Noted Bengali writer Mahasweta Devi is the only Indian besides V. S. Naipaul, among the 14 authors shortlisted for the 60,000 Pound Man Booker Prize that recognises lifetime contribution and achievement of a litterateur. An interesting development is a 51-minute documentary, Journeying with Mahasweta Devi produced by Drik-India, a photographer’s collective that focuses on issues of social activism and concern, and directed by Joshy Joseph, whose record in the field of documentaries is capped by four national awards won over four consecutive years. Born in 1926 in Bengal, during the British rule, Mahasweta Devi is one of India's foremost literary personalities. She has written over 100 novels, 400 short stories, edited Jim Corbett's writing, besides contributing articles and working among tribals and nomadic tribes. She is a committed social activist working for the uplift of tribals and marginal communities like landless labourers of eastern India. She is a socio-political commentator whose articles appear regularly in journals. Her empirical research into oral history of the cultures and memories of tribal communities is the first of its kind in India. Her powerful, haunting tales of exploitation and struggle are seen as rich sites of feminist discourse by leading scholars. Her innovative use of language has expanded the parameters of Bengali as a language of literary expression, achieved by imbibing and interweaving of tribal dialects into her writing. What motivated Joshy Joseph capture Mahasweta on celluloid? "Drik-India, which has produced my film, has around 140 hours of footage captured basically through her journeys in Nandigram during the revolt against industrialisation in Nandigram by the West Bengal Government. As a documentary filmmaker, I wanted to move away from the clich`E9d way of making her sit in front of the camera and make her talk continuously. But my film also has a chamber discussion shot at Baroda where Dr Ganesh Devi is asking her probing questions about the contradiction in her life where she wants peace but is pulled by any kind of human conflict. 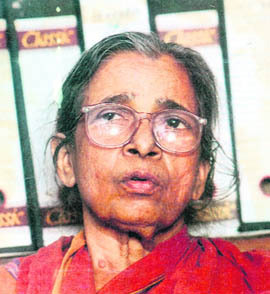 Dr Devi has been working with Mahasweta Devi in the Tejgarh tribal belt in Gujarat for many years. Having journeyed with her for over two years now, I hated to bog her down with my camera. I wanted to capture the free spirit she embodies, not the Mahasweta Devi who is an international celebrity," he elaborates. Joshy Joseph is a self-effacing filmmaker who has made socially significant documentaries over the years. He came in direct contact with the militant writer-activist with his film One Day from a Hangman’s Life. The film offered a satirical insight into a day in the life of Nata Mullick, the hangman who hung Dhananjoy Chatterjee a few years ago. It was banned from screening at Nandan at the instance of the West Bengal Chief Minister. "She was the only person among the Kolkata intelligentsia who raised her voice against the ban and that is how I met her. But I was not looking to capture a distant celebrity who people hold in awe. Didi does not fall within the trap of the 'celebrity' persona. She is irreverent, plain-talking to the point of being rude, and includes herself in her irreverent remarks and comments. I have captured her travelling in trains, cars, cabs and she has even sung a Tagore song for me. I was fascinated when she recited Tagore's famous poem Proshno extempore for me. I have kept all this in my film. You will find her calling herself and me a rascal with reference to this film. I have kept that too," Joshy laughs. Journeying with Mahasweta Devi is not a bio-pic. Joshy weaves in tiny nuggets of this writer-activist-crusader's earlier life through black-and-white pictures picked out of the family album turning sepia with time. It offers a picture of this rebellious woman, who at 83 is as irreverent, as disrespectful of false decorum as she was as a young girl. "My literature has always sprung from a fight for the rights of oppressed and downtrodden people. The tribal revolt against the British at the turn of the century formed the backbone of Aranyer Adhikar. My social activism is the driving force of all my literary activities, be it literature, my newspaper columns or the journal I edit. The lives of bonded labour provided me with a character like Dopadi. Their stories impart a narrative immediacy to my language," says Mahasweta Devi. During her first visit to Bombay in 1940, she stayed with uncle, Sachin Choudhury, founder of The Economic and Political Weekly. She read Veer Savarkar’s book on the Revolt of 1857 and the bravery of the Rani of Jhansi. This motivated her to visit Jhansi in the early 1950s. She heard songs about the queen's valour even 100 years after her death. Her novel Jhansi Rani was serialised in Desh (Bengali) literary weekly. Joshy has dispensed with the hierarchy between the filmmaker and his subject in this film. They function on the same platform. "Otherwise, it would have been difficult for me to break through and reach her. I would have been too much in awe of her to make an unbiased film that looks at her basically as a human being rather than the celebrity she is. If you keep your camera and record things in a way that the other person is conscious of the camera, the result will be artificial and will have a rehearsed look. But if I am around for a considerable amount of time without being a nuisance, then both the maker and the muse can settle down and be themselves," sums up Joshy. "I don’t make up stories. I go on making notes, jotting down dialogues, incidents...." she says. Dopdi Mejhen, Gangor, Sanichari — these are powerful Mahasweta women born out of her creative womb and acid pen.